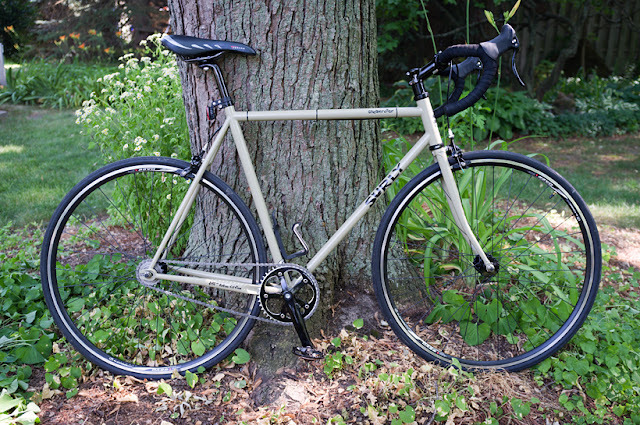 The Laughing Dog: A Single Speed Bike? Fixies have been around for years - In velodromes as well as other races, winter training, etc. But they achieved a cult status among the urban bike messenger community. They adopted track bikes with fixed-speed gears in the back, no brakes, and short crank arms allowing one to keep pedaling through the turns. 'Cause, well, you have no choice. A fixie does not have a freewheel. If you stop pedaling, the bike either forces your feet to keep moving, or you go into a skid - a technique one needs to perfect to ride a fixie in the streets of the city... They soon became a fad in the urban hipster culture, with many turning old road bikes into fixies, painting 'em black, and festooning 'em with stickers. As with all good fads, eventually yuppies, poseurs and 50-something white guys discover 'em, and manufacturers rush in to monetize the niche. And so it is with fixies. Often found under their "Urban" product heading, some have just tweaked their existing track bike frames with wheels designed to take the abuses of city riding, and with brakes to satisfy safety regulations. A few actually start with a clean sheet of paper, and apply a thought-out design philosophy to build a worthy machine. 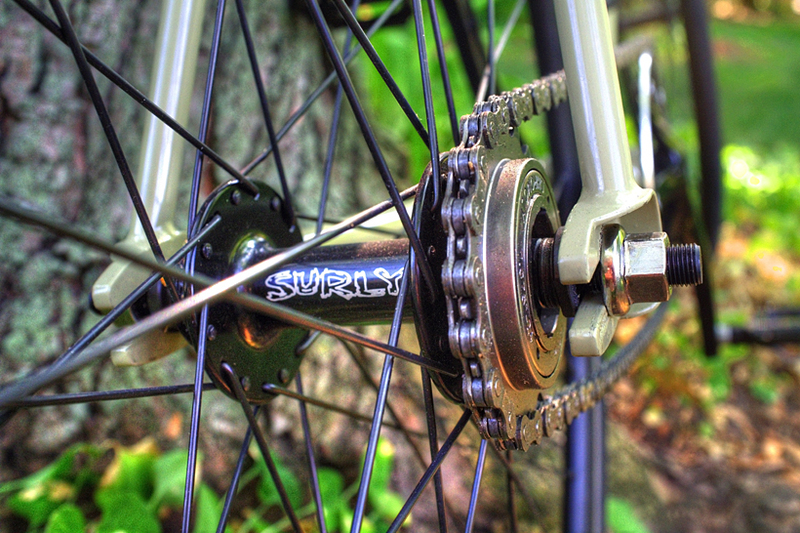 Surly's approach to their Steamroller resonated within me. Built with double-butted, chrome-moly steel tubing like the great road bikes of the 70's, and with a frame geometry that is more road bike than track bike, the Steamroller promised to be a strong, responsive machine that absorbs road bumps better than aluminum bikes. Then Surly outfitted it with parts that are low in name recognition and high in performance and value. They had one at our local bike shop, Velo City, that appeared to be a close fit. It's this year's model, and was marked way down. Apparently someone had ordered it but never took possession. Mike put my essential measurements into Fit Kit, and found both the seat tube and cockpit length to be nearly perfect for me. Only a minor handlebar stem swap was required. This year's version came with upright handlebars, and I asked Mike to change them for ControlTech alloy drop bars. I also asked him to change the fixed wheel cog for a freewheel, cause I'm still awfully fond of coasting, and he selected the ACS Crossfire. It came without pedals, and I selected a pair of black Shimano PD-A530 pedals. With platforms on one side, and SPD cleats on the other, I can hop on wearing sandals for a quick trip to Central Park Market, or put on my bike shoes, and clip in for some serious riding. It came with a 19 tooth rear gear, and a 44T chainring, and I kept that ratio when I put the freewheel on. That yields a 63 gear/inch ratio, and ~17 mph at 90 rpm. Kinda low, but I figure it'll get me over hills. As I get stronger, I'll use that as an excuse to upgrade. My first long ride was 27 miles through the country. It was a gas. The bike was as smooth and responsive as I had hoped. I could sit up and ride no-handed, but it took some concentration. Going uphill loaded up my quads. When I got to the top, and started spinning freely, the muscles were refreshed. That's a hellofa workout! I did find that I spun out relatively easy on the flats, but I was able to power over rolling hills easily. I haven't yet had to tackle any real steep hills, but I suspect I'll be able to climb out of the saddle and power my way over. The fit seems perfect. Time will tell, and Velo City is committed to after-sale tweaking. The stock seat just about hammered my tush to mush, and I've replaced it with a Selle Italia Flite 1990 saddle I found on sale. A couple of short rides suggest I'm gonna like it. Tomorrow I'm riding the 30 mile loop in the Allegrina 100, and that'll either confirm it, or not ... It may offer me a few chances to climb some real hills too!